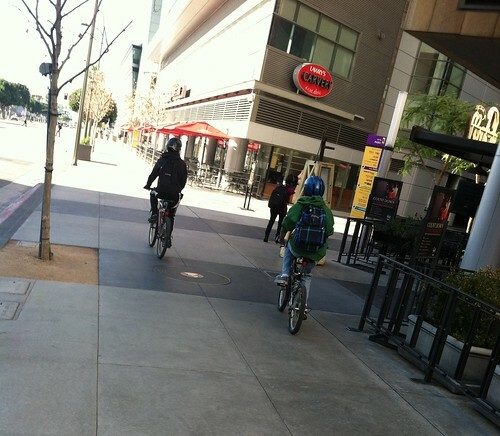 There are myriad rules in LA County governing the where riding a bicycle on the sidewalk is legal and where it is not. The City of Los Angeles allows riding a bicycle on the sidewalk unless it is done “with a willful or wanton disregard for the safety of persons or property”(LAMC 56.15). Other cities in LA County ban riding your bicycle on the sidewalk outright. Others still ban riding on the sidewalk only in places designated as “business districts”. These districts can sometimes be defined as an area contained by certain streets or they can be defined by the California Vehicle Code 240, which defines almost any building as being eligible for a “business district” that is not a single family home. You can download a pdf with the full Sidewalk Riding rules, and a color coded map showing the Sidewalk Riding rules for all of LA Count. Okay, considering this article says riding a bicycle on the sidewalk is legal in the City of Los Angeles, I have this question. I was driving my car in the right lane of a major street, and planning to turn right onto a side street at an upcoming corner. I observed a bicyclist on the sidewalk to my right approaching the same corner. Who has the right-of-way in that situation? Does the bicyclist have the same right-of-way as would be the case if he/she was actually on the street? This bicyclist, whom I made sure I was not going to hit when turning right, was pretty upset about having to hit the breaks. He wanted to take advantage of the curb ramps intended for people in wheelchairs, and zip straight across the side street. i have on-going problems with bikes on sidewalks … as vehicles they should be in the street where I can see and judge them… not acting as pedestrians ….when they can actually go pretty quick. Is it legal for two bicycles to travel next to each other. When riding on the street and a lane is too narrow for a bicyclist and motorist to share, a bicyclist may legally use the full lane. 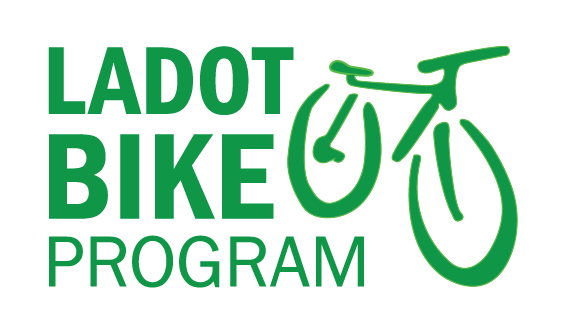 Bicyclists may ride further from the edge to avoid debris, parked cars (bicyclists should be safely out of the “door zone” so that if a driver opens the door doesn’t get hit or is forced to swerve to the left), or other hazards. Also, in California it is the law that drivers must pass with at least three feet when overtaking a bicyclist. As a result, unless a travel lane is very wide, bicyclists may use the full lane. Most lanes in the City of Los Angeles are between 10 and 11 feet wide and bicyclists may use the full lane. Although California Law does not explicitly state whether bicyclists can ride side by side, if they are legally taking the full lane this should not be an issue unless they are traveling on a street with only one lane. If a street has only one lane bicyclists may still use the full lane but must move aside if five or more cars have piled up behind them. The sidewalk law varies from municipality but in Los Angeles you can ride on the sidewalk as long as you are respectful of pedestrians and riding safely. As long as bicyclists are doing this, it is ok (but might be difficult in a lot of areas) to ride side-by-side. Thus afternoon I stepped out of a business onto the sidewalk on the block of 1520 N Cahueniga and was nearly run over by a bicyclist on the sidewalk who said as he passed that I should look where I’m going. Absolutely outrageous – and dangerous – that I should expect to be run over as a pedestrian in a sidewalk. Please post signs and educate!!!! !